Decree Appointing Committee or Trustee Under Chapter 518, Act 1929. It is Thereupon, this 1st day of September, 1943, Adjudged, Ordered and Decreed that JAMES E JONES and HENRY C JONES be and they are hereby appointed COMMITTEE with full power and authority to care for and manage the property of the said ULA V. JONES and upon proper order of this Court to expend cash for the support and maintenance of the said Ula V. Jones under the direction of this Court; but before the said JAMES E JONES AND HENRY C JONES shall proceed to act as such COMMITTEE they shall give a corporate bond to the STATE of Maryland in the penalty of ONE THOUSAND DOLLARS, with a surety or sureties to be approved by this Court or the Clerk thereof, for the faithful discharge of their duties as such COMMITTEE. I, JOHN S. CLARKE, Clerk of the Circuit Court No. 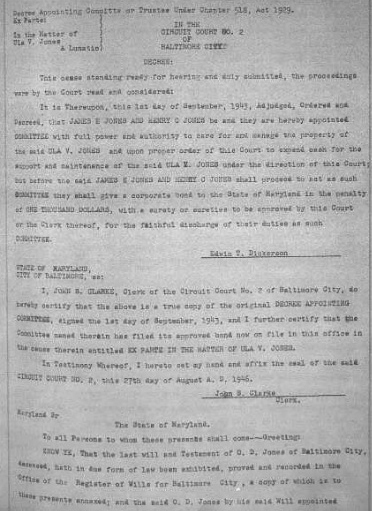 2 of Baltimore City, do hereby certify that the above is a true copy of the original DECREE APPOINTING COMMITTEE, signed the 1st day of September, 1943, and I further certify that the Committee named therein has filed its approved bond now on file in this office in the cause therein entitled EX PARTE IN THE MATTER OF ULA V. JONES. In Testimony Whereof, I hereto set my hand and affix the seal of the said CIRCUIT COURT NO. 2, this 27th day of August A. D. 1946. TO THE END, THEREFORE, that the personal estate of the said O. D. Jones deceased, may be collected, preserved and disposed of according to law, Administration of all the goods, chattels, credits and personal estate of the said O. D. Jones deceased, is hereby granted and committed unto James E. Jones and Henry C. Jones who is by these presents appointed Administrators with the Will annexed of the said O. D. Jones deceased. And full power and authority is hereby granted to the said Administrators with the Will annexed, to demand, collect receive and administer the goods chattels, credits and personal estate of O. D. Jones deceased, according to law, having already executed and filed in the office of the Register of Wills for Baltimore City, h bond to the State of Maryland with approved securities, well and truly to perform the office of Administrators with the Will annexed, of the said O. D. Jo nes deceased, according to law, and also taken an oath well and truly administer the goods, chattels, personal estate and credits of the said O. D. Jones deceased, to the best of their knowledge according to the law, and to give a just account of their administration when thereto they shall be lawfully called. 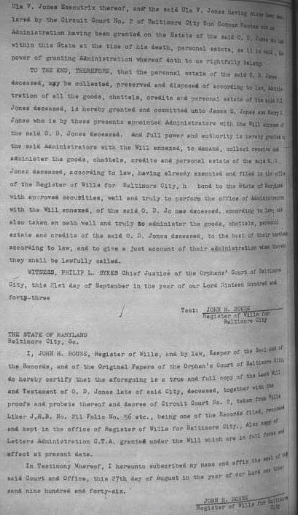 I, JOHN H. BOUSE, Register of Wills, and by law, Keeper of the Seal and of the Records, and of the Original Papers of the Orphan's Court of Baltimore City, do hereby certify that the aforegoing is a true and full copy of the Last Will and Testament of O. D. Jones late of said City, deceased, together with the proofs and probate thereof and decree of Circuit Court No. 2 taken from Wills Liber J.H.B. No.211 Folio No. 56 etc., being one of the Records filed, recorded and kept in the office of Register of Wills for Baltimore City., Also copy of Letters Administration C.T.A. granted under the Will which are in full force and effect at present date. 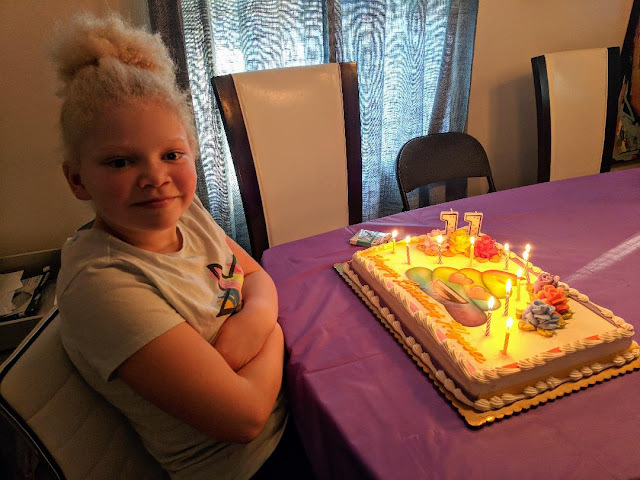 In Testimony Whereof, I hereunto subscribed my name and affix the seal of the said Court and Office, this 27th day of August in the year of our Lord one thousand nine hundred and forty-six. 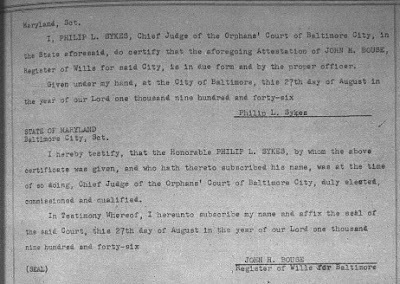 I, PHILIP L. SYKES, Chief Judge of the Orphans' Court of Baltimore City, in the State aforesaid, so certify that the aforegoing Attestation of JOHN H. BOUSE, Register of Wills for said City, is in due form and by the proper officer. 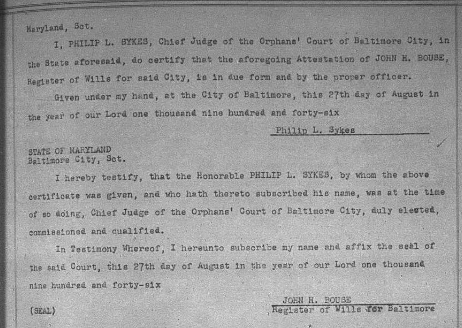 I hereby testify, that the Honorable Philip L. Sykes, by whom the above certificate was given, and who hath thereto subscribed his name, was at the time of so doing, Chief Judge of the Orphans' Court of Baltimore City, duly elected, commissioned, and qualified. 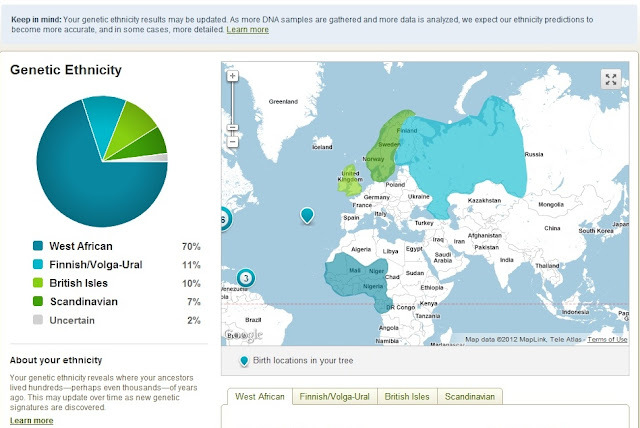 Okay it is official. My eyeballs have just fallen out of my head. 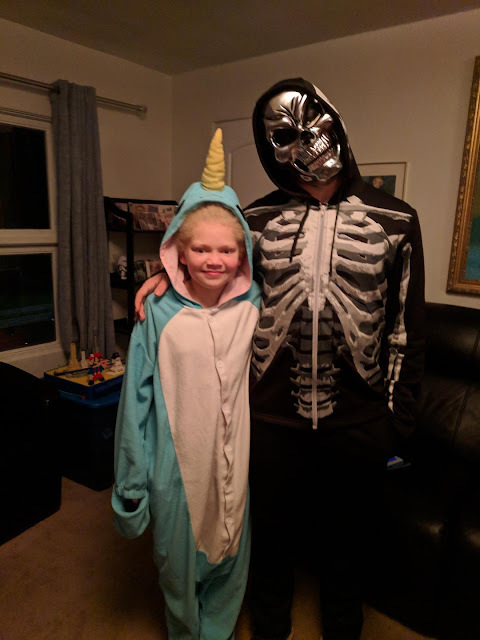 I had to make an adjustment to the title of this post since it is now officially Tuesday (1:27am.) I will take this as my cue to go to sleep and pick up with things tomorrow. Boy, that's a lot of heavy language. What I'm getting from all this is that after Dr. Oscar Jones died and Ulla Jones was declared Non Compos Mentis, then Henry Jones and James Jones were given charge of the entire estate by the court. I'm sure there are parts here that I'm not noticing. . . .